The middle-income class is hollowing out and it’s hurting US economic growth. Only about a quarter of a per cent of US households have climbed up the ladder from the middle class into the upper income bracket since 2000, according to the latest review by the IMF. Meanwhile, more than 3% of middle-income households have moved into the low-income bracket. That’s a flip from the trend between 1970 and 2000, where middle-income households were more likely to move upward. 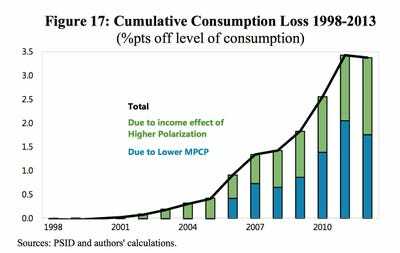 Combined with real income stagnation, polarization has had a negative impact on the economy, hampering the main engine of the U.S. growth: consumption. The analysis in our new paper suggests that over 1998 — 2013, the U.S. economy has lost the equivalent of more than one year of consumption due to increased polarization. That’s a pretty worrying trend, considering low- and middle-income households spend a far larger slice of their income than wealthier households. The IMF defined middle-income households — which is often a proxy for discussions on income polarization — as those whose real incomes are within 50 to 150% of the median income. The share of middle-income households has shrunk to 47% in 2014 from 58% in 1970, while lower-income households’ share was little changed at around 5% of total national income, the IMF report shows. more concentrated pool of wealth is affecting the creditworthiness of an average borrower. It’s not just the super-rich who are at fault for the increased polarization, however. The number of men who have taken lower paid jobs has shot up over the past four decades, while that of women edged up, according to the IMF.